The United Nations General Assembly voted on Tuesday on a resolution calling on Washington to end its embargo on Cuba. 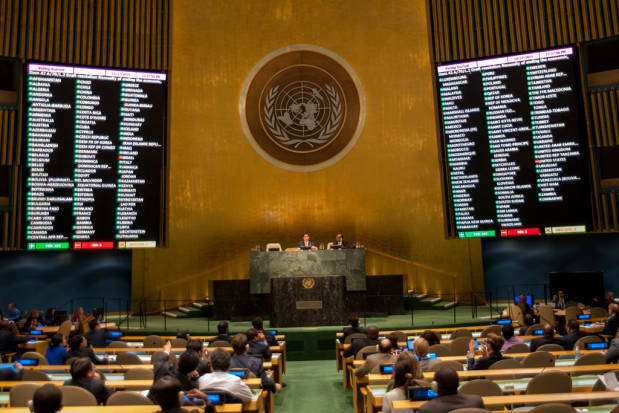 191 of 193 countries voted for the resolution -- 99 percent of the member states. The 191 green lights are the 99 percent of the world who voted for the resolution. The mere two red lights are the one percent who opposed it. This is what a true rogue state looks like. And this is not the beginning -- far from it. In both the 2013 and 2014 votes on the resolution, which were identical, 188 (97 percent) of U.N. member states voted to end the embargo on Cuba. The U.S. and Israel were the only ones to oppose it. The Washington-allied Pacific island nations of Palau, Marshall Islands, and Micronesia abstained. An embargo of sugar, oil, and weapons was first imposed on Cuba by President Eisenhower in 1960. In 1962, two years later, the Kennedy administration expanded the embargo to impede virtually all imports. Since the collapse of the Soviet Union, the international community has called for an end to the embargo, while Washington has adamantly insisted that it must continue to stymie trade with the small socialist island state. During the 1962 Cuban Missile Crisis, the U.S. imposed a blockade on Cuba. After the incident, the blockade was reduced to an embargo. Today, some argue the U.S. embargo on Cuba does not constitute a blockade. Cuba, however, officially refers to the embargo as a blockade, as do other countries. At the U.N., Argentina, Venezuela, and others have called the embargo a blockade. Moreover, although the U.S. has argued the unilateral embargo is not illegal, Argentina and Venezuela, along with Bolivia, China, and other countries have argued that it is in contravention of international law and/or the U.N. Charter. 55 years later, the U.S. has finally moved toward rapprochement with Cuba. The U.N. reported that the General Assembly "welcomed the resumption of diplomatic relations between the U.S. and Cuba," in what is a truly historical development. But, with its vote at the U.N., the U.S. -- true to its imperial nature -- continues to convey that it will only act on its own terms, not on those of the international community. The Cuban embargo is by no means the only issue on which the U.S. is isolated from the rest of the world, nor is it a coincidence that Israel has continuously voted with it. In July, the U.S. was, yet again, the only country in the world to directly oppose a resolution calling for Israel to be held accountable for war crimes it committed in its 2014 war on Gaza. At the 29th regular session of the U.N. Human Rights Council (UNHRC), Washington alone voted against "ensuring accountability and justice for all violations of international law in" the illegally Occupied Palestinian Territories (OPT). One year before, the U.S. was, once more, the only country on the UNHRC to oppose "ensuring respect for international law in the OPT." Moreover, in 2012, the U.S. led eight allies, including Israel and Canada, in a vote against non-member observer status for Palestine at the U.N., which was supported by 138 countries. American exceptionalism may be a deranged lie, a dangerous myth, and a sick joke, but the U.S. government sure believes it. The Obama administration has often tried to differentiate itself from the Bush administration by appealing to rhetoric concerning international law. Yet votes like these prove such statements to be hollow. Behind the veneer of Obama's emphasis on international rules and norms is the cold logic of empire: The U.S., as the global economic and military hegemon, will do what it wants, when it wants. By blatantly spitting in the face of the international community for the 24th time, America only continues to reinforce its global reputation as a rogue state.